Easter is coming and the Easter Day Parade is fun to see at the Magic Kingdom this month. The April crowd at Disney are on average estimated to be mid to high. 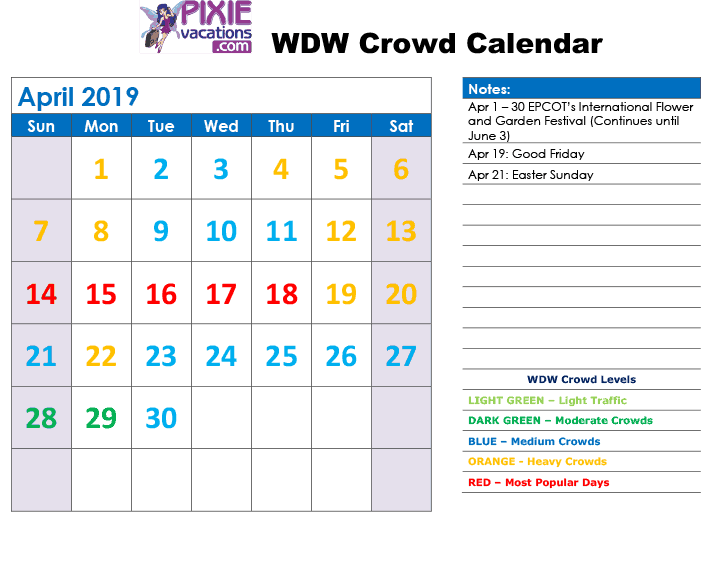 Spring Break is still going strong and that keeps park attendance up at the Disney parks and means you need to have a Disney FastPass strategy for higher estimated crowd days. One nice thing about April in Florida is the weather. It’s not Summer time yet and you can have some perfect days to be walking outside in the Disney parks. The best strategy for the Disney parks in April is just go with the flow and grab the park days in the middle of the week. April has high traffic with Spring Break and now Easter week too. Locals love the nice Florida weather and are in the parks with their Florida resident passes and Disney Annual Passes. You can avoid the extra bump in attendance by trying to avoid Disney parks on the weekends when the locals come to the resort and add to the crowds. Again, use your Fastpasses, have a plan, use Extra Magic House for those of you staying on Disney property. Don’t worry I have loads of tips for avoid the crowds at Walt Disney World and am happy to help. Easter is also a great time to enjoy the extra magical that Walt Disney World brings to their parks and resorts. The Magic Kingdom has the Easter Day parade down Main Street USA and the parks is dressed in it’s Sunday’s best. Epcot has an Easter Egg Challenge that keeps the kids looking for hidden surprises in each country while the grown ups can take their time around World Showcase. The kids even get an Easter Surprise when they complete the scavenger hunt, yes they did pay for it, but it kept them entertained on the one mile walk around the lagoon. The Disney World Resort hotels like the Grand Floridian Beach resort is a prefect place for an Easter Egg Hunt and other fun activities for the resort guests. I have been there watching kids grab up hundreds of eggs that were scattered on the perfectly manicured lawns. 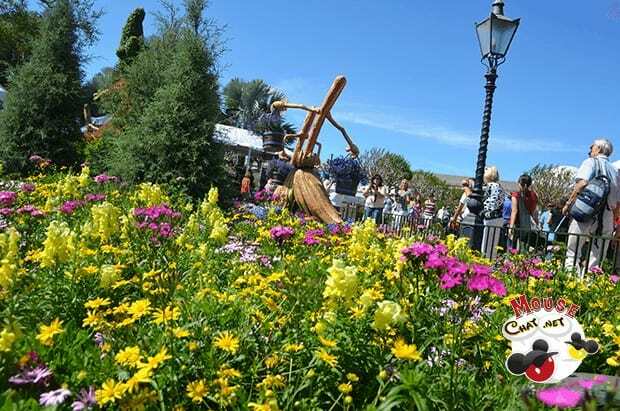 This is also a perfect month to enjoy Epcot’s International Flower and Garden Festival. The festival continues from March and into June. 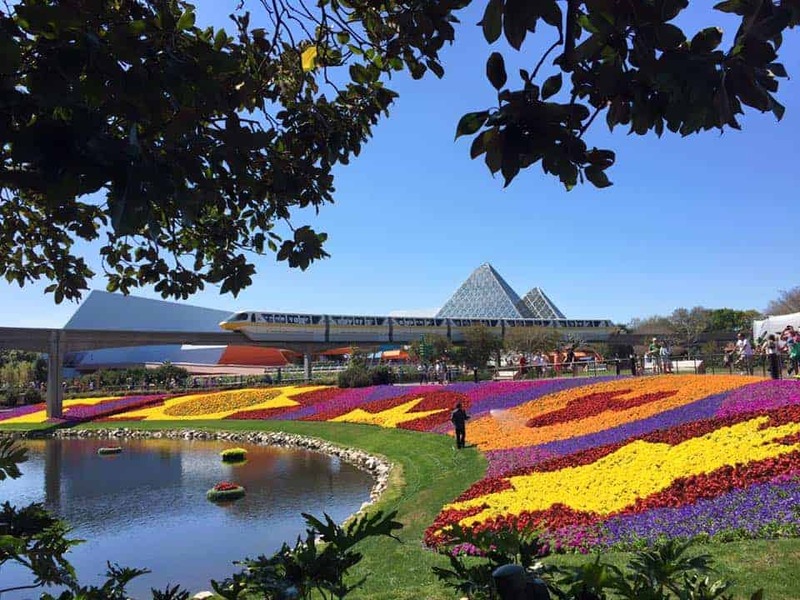 If you missed my earlier review of the Flower and Garden Festival at Epcot, the highlights are, it’s one of my favorite things to do at Walt Disney World. And the Disney festival is already part of your Epcot base admission ticket price. You can add other festival events at an extra cost, but just enjoying the butterfly house, the different gardens and free demonstrations is well worth it.